"India cannot fulfil its dream of producing world leaders in the 21st century with the 19th century education system ", said Sundar Pichai, CEO Google , at a recent confluence at IIT-KGP. He talks of revamping the system of education at the premier and higher institutes of learning . He talks of replacing rote learning with the ever evolving process of integrated and multi-disciplinary learning and unlearning . TRUE !! But what about students , little ones , growing up into teenagers, oblivious of Sundar and the technological advancements and its requisites. These kids, studying in Thane Municipal Corporation School, coming from a very modest background , come to school with a vision which is not a penny more than, just learning to read and write properly . Trust me, even this little dream remains a distant and nebulous imagination. I am just trying to make a bit of a difference in their lives . I am just trying to establish a proper learning centre within the precincts of the school ,with the most basic educational infrastructure. I need a little of your hard earned money to let the distanced corner of learning reduce its distance for these "nation builders" as Pandit Nehru used to call them. 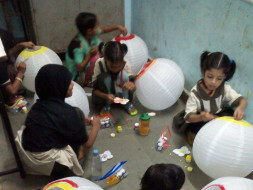 I am a Gandhi fellow and I currently work with different schools of Thane municipal corporation in Thane and Mumbra. Please support our cause by donating a minimum of ₹ 100 and sharing the link for the cause. You can visit the school and see the difference your donation has created. "A man sees this world with eyes he was seen as when growing up." I just want to make their vision for tomorrow, as clear as possible, within my capabilities. Support me if you feel connected.